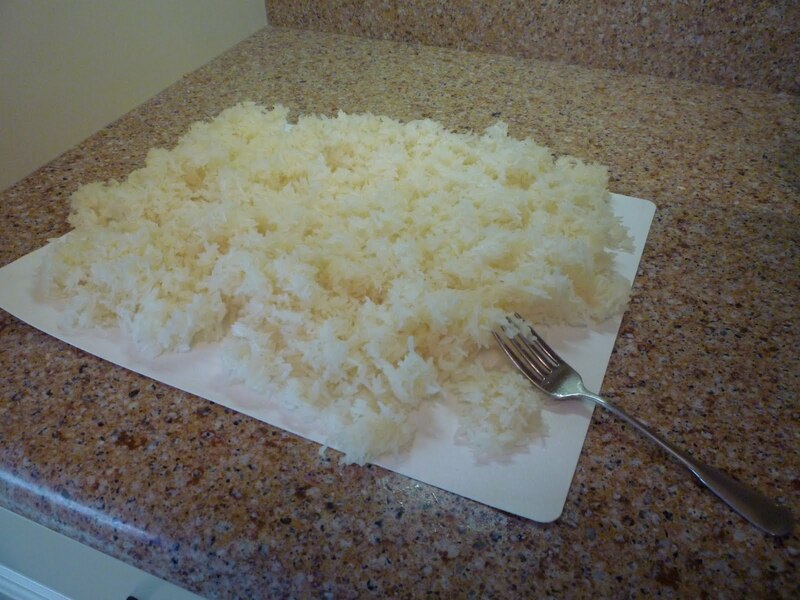 Ten years ago we had a Laotian neighbor who invited us to her wedding, where we experienced our first Thai sticky rice. Moist and chewy, but at the same time clean and dry enough to pick up with our hands out of a giant basket on the buffet table. It was aromatic, but different from jasmine rice. Some years after getting the recipe from our friend I produced a good batch; she had moved away by then. 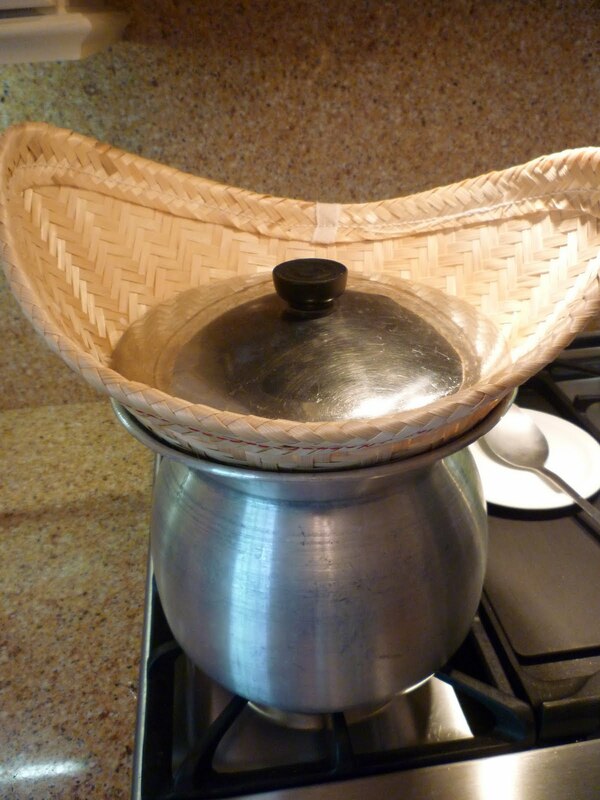 The first several times it scorched cooking in a regular pot, but eventually I read online that what I needed for success was a certain type of basket steamer, which I bought at a Southeast Asian store for under $10. It’s so easy now to make this kind of rice. Start with a bag labeled Sweet Rice that is found at the same kind of store. The typical Japanese/Chinese/Korean Asian market near here doesn’t even have it. 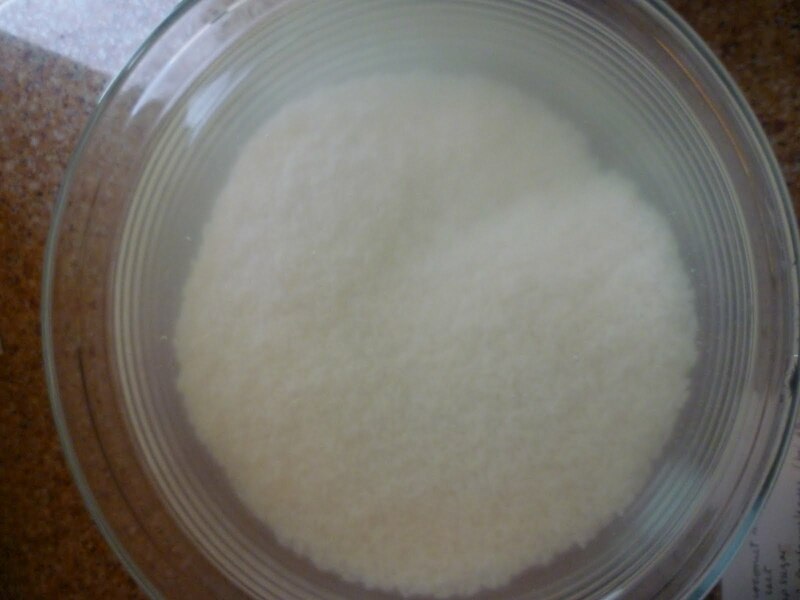 I don’t have to measure, but I put three or four cups of sweet rice into a bowl for soaking, and then rinse it several times until the water is almost clear. Tonight I used four cups. You have to soak it most of the day if you are using cold water, but I read somewhere that I could use hot water for soaking and it would only require an hour or two. So I almost always do it that way. 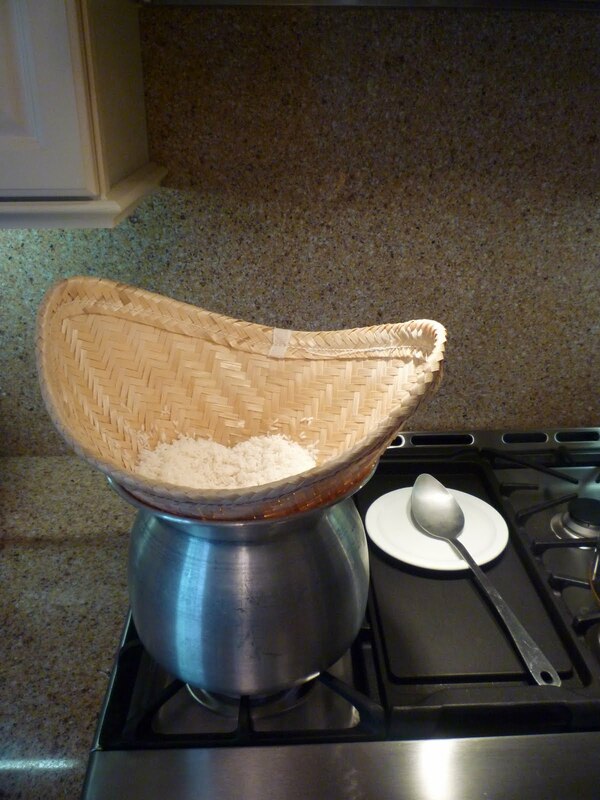 After soaking, heat some water in the steamer pot, drain the rice into the basket over the sink, and set the basket of rice over the steaming water. Put a sizable lid from some other pot over it to keep the steam in.It takes about 20 minutes to cook; sometimes I turn the lump of rice over midway. When it is tender, dump it out on to a board or mat big enough that you can spread it out with a fork to cool it down, to keep it from overcooking into a soggy lump. At this point you can form it into balls, as I did for my grandchildren last week–balls that can be dipped in a coconut sauce. I often put a pile into a bowl and ladle Thai stew over it. 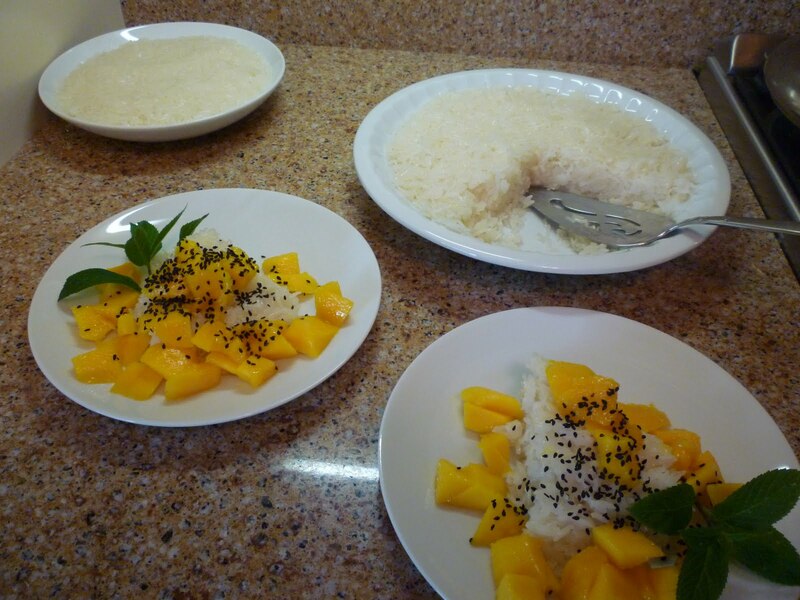 But tonight I mixed the cooked and still warm rice with sweetened coconut milk to which lime juice had been added, to make a platform for chunks of mango. Those are not ants, but black sesame seeds sprinkled on top, as I assured my husband. 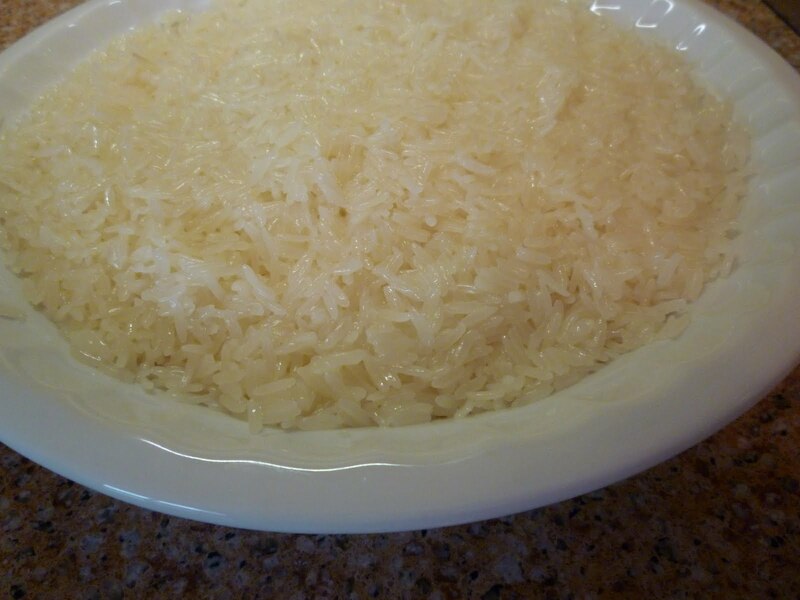 A can of coconut milk, 1/3 cup sugar, 1/2 teaspoon salt and 2 tablespoons lime juice boiled together made the sauce that I poured over the rice that was still warm, then pressed it into a shallow pie plate and a pasta bowl. Within ten minutes it was firm enough to cut into wedges with a knife. It got even firmer when cold. 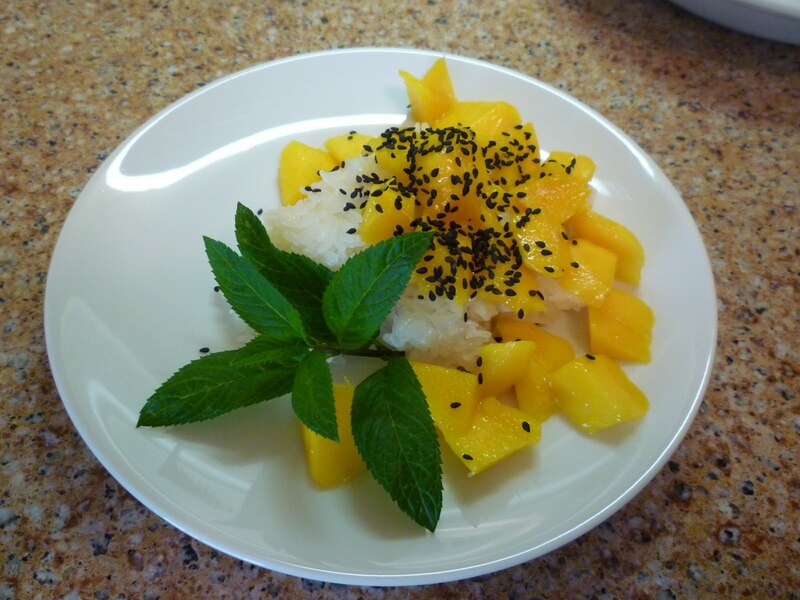 This dish is called, naturally, Sticky Rice with Mango. That's amazing stuff…my husband had a friend from Thailand when we were in the Army. They gave us a steamer and basket….you can often see a bowl of sticky rice soaking in water on our counter…ready to be steamed. Yum. This looks and sounds absolutely delicious! I'm going to be looking for a basket. My family would love this. Thank you for sharing! I so love this dish at the Thai restaurants! I will have to get a steamer when I am down there some day (and some rice). Bub would be thrilled. Have you had the dish with the sweet sticky rice and a layer of “custard” (not exactly; firmer and drier) on top? I wonder how they make that one. Wow, you made it look so lovely. This does look really wonderful. I have not had much success with rice cooking, but I am going to keep trying. Fascinating! Wish I had several lifetimes to travel around and sample all of these wonderful ethnic foods. oh I always loved this dessert! So light and fresh and sweet and entirely satisfying.